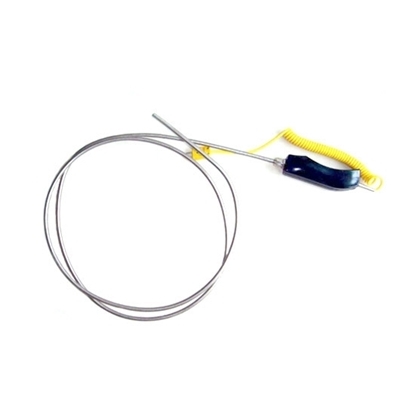 Sheath thermocouple have shielded thermocouple wire of common length 500mm and sheath diameter Ф3~Φ8mm, with flexibility, high pressure resistant, fast thermal response time and long operating life. K type thermocouple can directly measure the temperature of liquid, vapor, gas medium and solid surface in the range of 0~950 ℃ in various production processes. 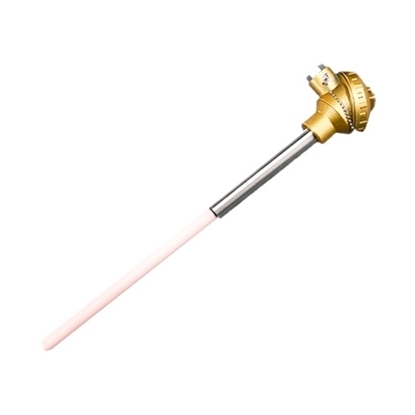 E type thermocouple has the highest thermoelectric force and sensitivity in base metals. 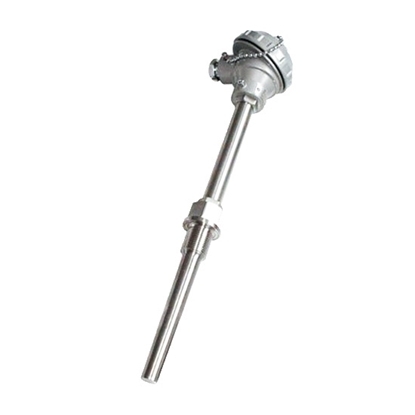 Sheath thermocouple have shielded thermocouple wire of common length 500mm and sheath diameter Ф3~Φ8mm, with flexibility, high pressure resistant, fast thermal response time and long operating life. 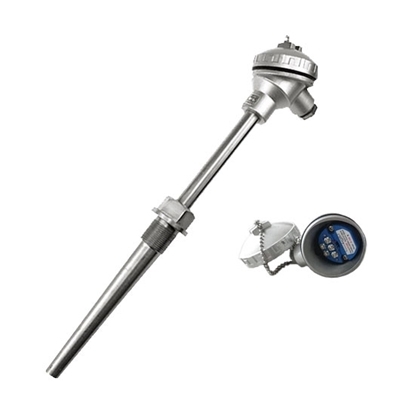 E type thermocouple can directly measure the temperature of liquid, vapor, gas medium and solid surface in the range of 0~700 ℃ in various production processes. 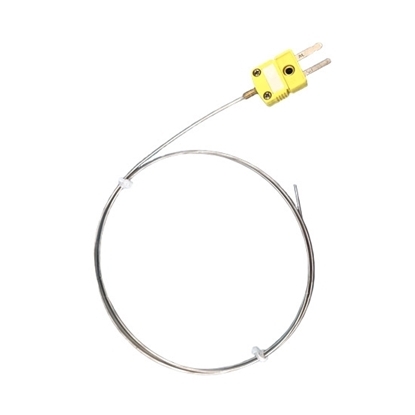 Sheath thermocouple have shielded thermocouple wire of common length 500mm and sheath diameter Ф3~Φ8mm, with flexibility, high pressure resistant, fast thermal response time and long operating life. 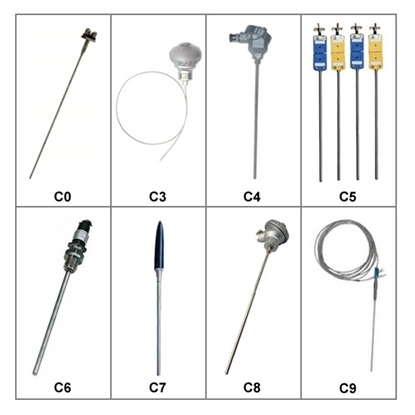 J type thermocouple can directly measure the temperature of liquid, vapor, gas medium and solid surface in the range of 0~600 ℃ in various production processes, especially in vacuum, oxidation, reduction or inert atmosphere. 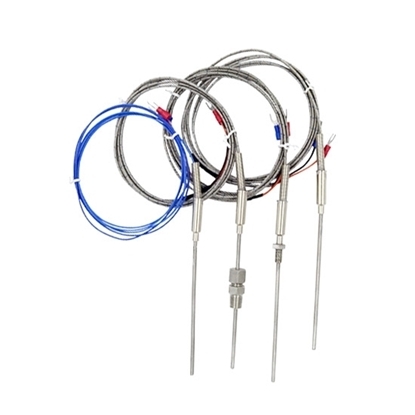 T type thermocouple has the highest accuracy and lowest price in base metals. 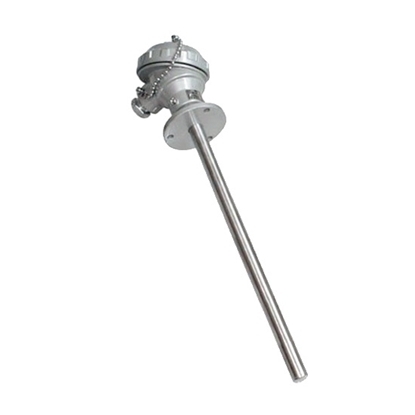 Sheath thermocouple have shielded thermocouple wire of common length 500mm and sheath diameter Ф3~Φ8mm, with flexibility, high pressure resistant, fast thermal response time and long operating life. T type thermocouple can directly measure the temperature of liquid, vapor, gas medium and solid surface in the range of -200~+350 ℃ in various production processes. S type thermocouple assembles with protection head and corundum thermowell, should use wooden case for packing. Its thermo wire diameter is Ф0.5mm. 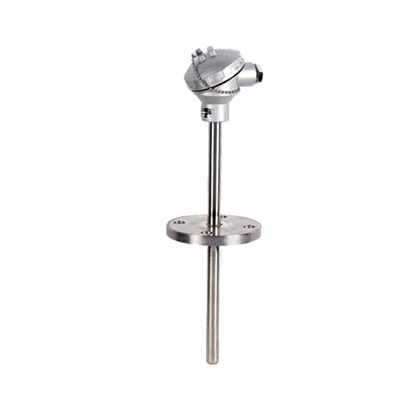 S type thermocouple has high accuracy and good stability, can directly measure the temperature of liquid, vapor, gas medium and solid surface in the range of 0~1200 ℃ in various production processes. 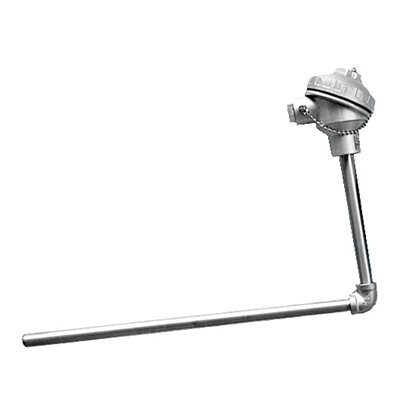 K type thermocouple assembles with protection head and stainless steel thermowell, with high pressure resistant, fast thermal response time and long operating life. Its thermo wire diameter is Ф2.5mm. K type thermocouple can directly measure the temperature of liquid, vapor, gas medium and solid surface in the range of 0~1000 ℃ in various production processes. R type thermocouple assembles with protection head and corundum thermowell, should use wooden case for packing. Its thermo wire diameter is Ф0.5mm. R type thermocouple can directly measure the temperature in the range of 0~1600 ℃ in various production processes. 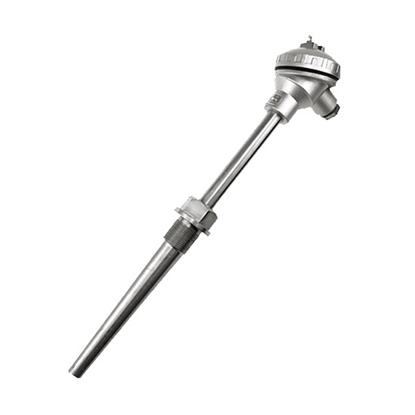 K type thermocouple assembles with protection head and stainless steel thermowell, built-in small transmitter. It converts temperature to 4-20mA standard signal, and outputs to display instrument or DCS system in control room. Transmitter adopts silicone rubber seal structure, save extension wire, good anti-interference ability. Measuring temperature range 0~1000 ℃. 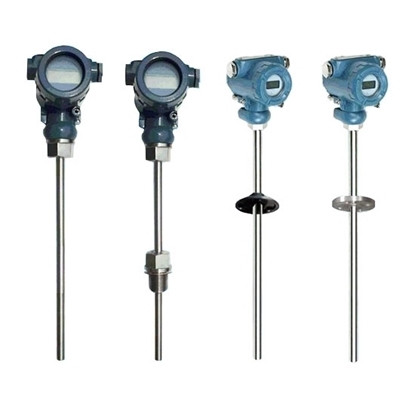 K type thermocouple with digital meter can directly display high-precision real-time temperature. It converts temperature to 4-20mA standard signal and outputs to display instrument or DCS system in control room. Built-in small transmitter adopts silicone rubber seal structure, good anti-interference ability, shock and humidity, apply to harsh environments. Measuring temperature range 0~1000 ℃.